I love to share information, and I wanted to be transparent about my Botox experience. I’ve been injecting Botox since around 2006. We started having more detailed tracking available to us starting in 2010 by having patients enroll in Brilliant Distinctions. The Botox statistics were obtained from Brilliant Distinctions Analytics. This is a free service included with our participation in Allergan‘s Brilliant Distinctions program which is a “frequent flyer rewards” type program. It is a free program for our patients to enroll. I’ve been keeping simple statistics of my Modesto Botox practice before by looking at total number of patients enrolled and looking at the total amount of coupons redeemed. Most of our Botox patients are enrolled in the Brilliant Distinctions patients. As are our Juvederm and Latisse patients. We do not currently have SkinMedica which is part of the Allergan family. But feel free to call us to see if we have encorporated SkinMedica into our collection of skin care products. (209) 551-1888. Not all of our patients are enrolled in the Brilliant Distinctions program. More and more existing patients enrolled in Brilliant Distinctions as the program became more familiar to us. This means that any increases in the number of patients “seen” for Botox, may actually be lower than the reported number because the numbers we have reflect Botox patient enrollment into Brilliant Distinctions, not necessarily patients who have received Botox. Thus we are using Brilliant Distinctions registered visits as a surrogate for actual Botox visits. But i think the estimate is pretty close because we try to enroll all Botox patients into Brilliant Distinctions. 724 separate patient visits over the year for 2013. 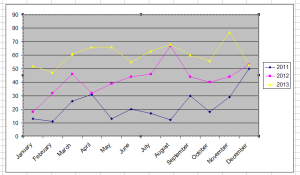 This represents a 43% increase over 2012 where I had 505 separate patient visits. In 2011 we had 270 patients registered. But I think this number might be “artificially” lower because many of our patients at the time weren’t signed up for Brilliant Distinctions. How is this calculated? I went through the Analytics part of Brilliant Distinctions and had the computer program extract out the patient data one month at a time. Averaging 60.3 Botox Visits per month. 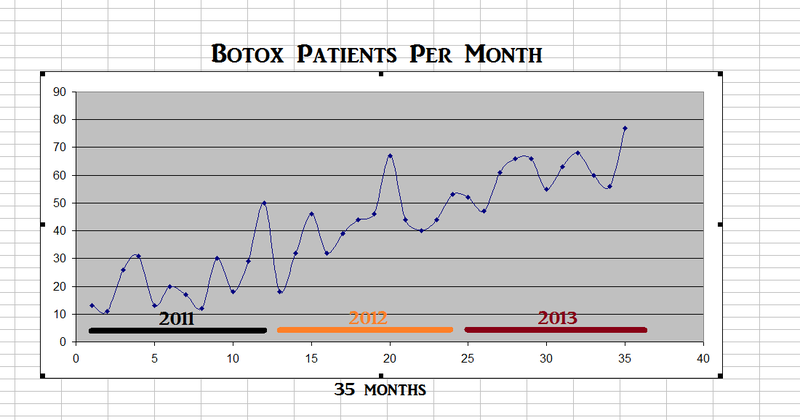 60.3 Botox visits per month is the average number of visits per month for 2013. 374 unique patients seen for Botox Cosmetic injections who are registered in Brilliant Distinctions in 2013. In 2012 we had 278 unique patients seen for Botox injections. In 2011 we had 180 Botox different patients. Unique, or different, patients means that these patients were counted only once even if they came to the office several times over the year. I couldn’t seem to find too many monthly trends with our Botox Visits. 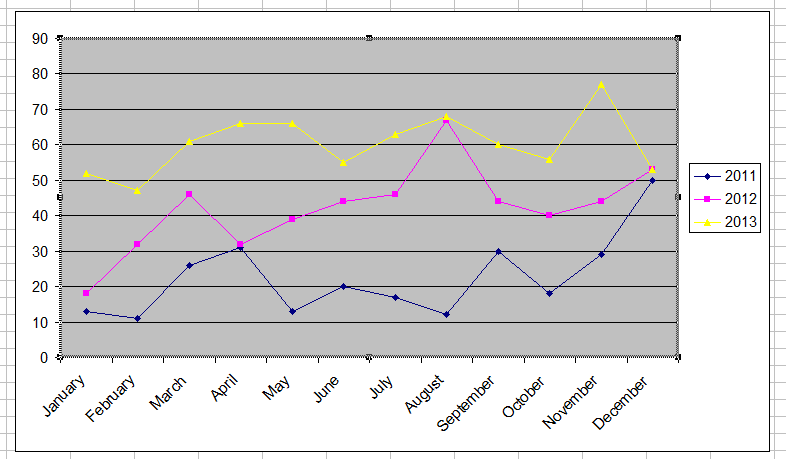 But from what I can see over three years of data, it seems that there is a consistent increase in patients in March and November. I’m not sure about these seasonal changes, but this may be specific to our town of Modesto, CA. We grew to have about 245 new Brilliant Distinctions Signups in the last year. This also includes Juvederm-only and Latisse-only-patients. This averages about .67 new Botox/Juvederm/Latisse patients per day (365 days per year). We reached 702 unique patients on Brilliant distinctions. This growth in the number of unique patients is very steady – it doesn’t seem to be increasing exponentially, just a direct increase which is steady. Financial analysis and comparison with the other components of my medical and surgical practice. I have many medical colleagues and students who ask is a profession of doing Botox worth it? They mainly ask from a standpoint of does Botox make money? Without going into gory details. I can say that the other parts of my medical practice was more profitable than the Botox part of the practice. As with any other medical practice there’s the personal satisfaction aspect. For me is very satisfying to be injecting Botox. I enjoy the process and having wonderful patients who value appearance and beauty. And most of all, I enjoy working with my wife who is a plastic surgeon. I have been working with her since we moved to Modesto in 2003. However, it became an every-day work experience together since 2006 after we founded Surgical Artistry in Modesto, CA. Another financial rewards related Botox question: How much overhead does one have when injecting? I guess one way to answer this question would be to look at my Botox and Dermal Filler practice in a vacuum. Botox and Fillers (ie. Juvederm Voluma, Juvederm Ultra, Juvederm Ultra Plus XC, Belotero Balance, etc) are expensive for the practice to buy. These are the most expensive products I have ever had for my surgical practice. Expensive in terms of price for size of product. In my estimation, I think a Cosmetic Injectible practice’s overhead with lasers (I have one laser) would be about 75%. Meaning there’s a 25% profit margin. This is without a surgical practice, vein practice or acupuncture practice. I don’t use our laser all that much, and this figure of a 25% profit margin on a Botox/Filler/Laser non-invasive cosmetic practice is for my practice. I’m sure it would vary. I’m factoring in the cost of the products and the overhead costs of the office – staffing, malpractice insurance, rent, utilities, supplies (syringes, etc). And this figure would be before tax – which will of course, take out another chunk! I hope this information helps. I’m thinking that most of the people reading up to this point are Botox injectors of sorts or interested in becoming one. 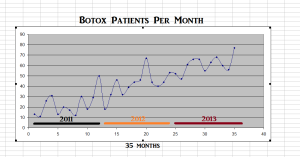 The graph shows the Botox Patient Visits for the past consecutive 35 months. It is missing December 2013’s data. But for 35 months before December, it is shown above. Botox is growing at our practice in Modesto. There is definitely room for even more growth for my practice. 724 separate Botox visits is certainly a good “start.” I think my practice could handle twice that. I guess we shall see what 2014 holds – this is hard for me to predict. I think our growth will slow percentage-wise for 2014, I think it will be lower than the 43% growth we achieved this year. I think I would be happy with a 15% growth in the amount of Botox appointments. A 15% growth for next year will reveal 833 patients. So perhaps that’s my prediction for 2014. We currently have 702 different patients signed up for Brilliant distinctions. If I were to be ambitious, I would hope to break 1000 new patients in our Modesto Practice’s Brilliant Distinctions program. But a conservative estimate based on calculations over the past 3 years would be 947 members signed up.